One of the most valuable Bentleys in existence is making an appearance at the brands headquarters in Crewe. The 4¼-litre 'Embiricos' special will be on display at the Lineage Showroom at the firm’s Pyms Lane factory until September. The name comes from André Embiricos, a wealthy Greek racing driver who lived in Paris. Bentley's Paris agent put him in touch with Georges Paulin, a designer working for the coachbuilders Pourtout Carrossier. Under Paulin’s guidance, Pourtout produced an aerodynamic body for a 4¼-litre Derby Bentley that would be suitable for fast touring. To keep the weight down the fastback body with a split rear window was crafted in Duralumin, an age-hardenable aluminium alloy. The ‘Embiricos’ Bentley achieved a timed 114.64mph over an hour at Brooklands, yet was civilised enough for Embiricos to use as a road car. Embiricos sold his unique Bentley late in 1939 to H.S.F. Hay who raced it in three post-war Le Mans 24-hour races, achieving sixthplace in 1949. Throughout the 1930s Bentley Motors, then owned by Rolls-Royce, was producing fast, refined and well-built Grand Tourers from its Derby factory. While many customers sent their chassis to traditional coachbuilders such as Vanden Plas, H.J. Mulliner or Park Ward for elegant bodywork, enthusiasts from across the Channel, where the roads were longer and faster, were eager to explore the new world of aerodynamics. With the support of the factory, one such owner decided to investigate the possibility of a streamlined high-performance Bentley. The result was the most famous Bentley of the Derby era. Although a one-off, reaction to the Embiricos Bentley encouraged the company to explore more streamlined styles for future production models. 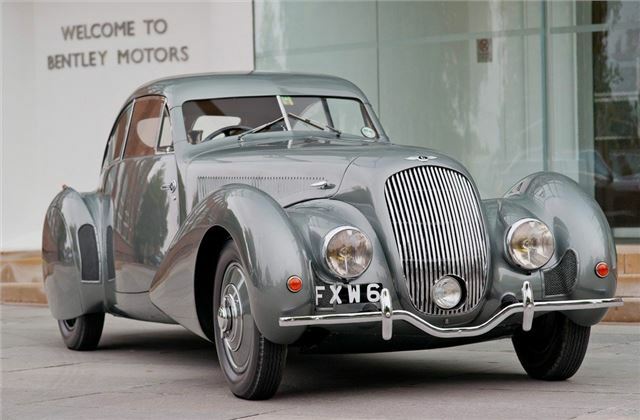 In 1939 Bentley designer Ivan Evernden worked with Paulin on a sleek Mark V prototype called Corniche. Unfortunately it was in France when WWII broke out and was destroyed during a bombing raid on Dieppe while awaiting shipment to Britain. Post-war, many of the lessons of the Embiricos Bentley reached fruition in the glorious lines of the 1952 R Type Continental, and as such continue to be reflected in the iconic shape of today’s Continental GT coupe. It's a Derby built Bentley 4-1/4 Litre, not a 4-1/2 Litre which was made at the old Cricklewood factory.